The Red Barn was located just behind Recitation Hall. On December 30, 1919, the Board of Regents authorized "the erection of a temporary gymnasium building form the student fund, and also the purchase of physical education equipment." "The temporary Gymnasium was constructed largely with student help. Some of this help when regularly employed in summer vacations and at other times, is paid for out of funds derived from the student fund. The same thing is true with the carpenters employed. This building has a splendid Gymnasium floor and will be a success except in very cold weather. We believe, however, it will be necessary to put wall board on the inside in order to make it usable during the winter. We have decided to install two large stoves in the Gymnasium and not attempt putting in a heating plant with baths and hot water as was originally planned . . . "
In Earl Ruby's Red Towel Territory, he describes the "Little Red Barn" as having "rafters running across, hardly 18 feet above the floor" and seating 250 spectators. In the fall of 1920, the structure was first used for six weeks to house 40 male and female students until housing could be arranged. Several descriptions of men's and women's (college & Training School) basketball games state they were played in the "Teachers College gymnasium" [particularly in College Heights Herald, Feb. 26, 1925]. Harrison's Western Kentucky University and several descriptions of games after the completion of the Training School building in 1925 refer to Western games being played in the "Training School gym" or the "College High gym." The February 1930 College Heights Herald, in describing the need for the new gymnasium stated: "Since the building of the Training School, the gymnasium did not have seating capacity for more than one-fourth of the people who attend the basketball games." Yet, I did find reference to a February 1926 women's game in the Teachers College gymnasium. This early gym was also used to house faculty families including my mother, Nelle Goodh Travelstead, my brother Will Gooch Travelstead and me. Suspended sheets hung on wires separated the "rooms" we lived in. The old gymnasium building of Western Teachers College has recently given way to the general plan of beautification being carried forward on the campus of this school, having served its purposes which were manifold. It was used not only as a gymnasium and classroom, but during the housing shortage of 1918 prior to the building of the first dormitory, it temporarily sheltered about fifty young women who had arrived for the summer term only to find no rooms available. Conditions following the war coupled with the oil boom at that time in Warren County had made the housing situation very acute, so partitions were placed in the old gymnasium and it was pressed into service as a temporary dormitory. Miss Elizabeth Woods served as hostess at this time. I am disturbed by the media people who contiue to refer to the Health and Physical Building (that later became the Helm Library) as the "Old Red Barn." I have examined the documents relating to those buildings, and I attended games at Western regularly from about 1936. 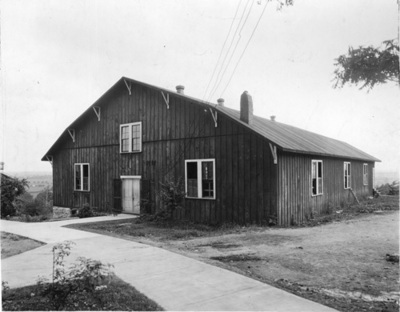 I believe that the "Old Red Barn" name should be used only in connection with the hastily built structure that was located back of the Recitation Hall (which was replaced by Cherry Hall). As I recall, President Cherry said that it did not have to be built of the best lumber, and I believe that it was not heated. The basketball team used the gym in the Training School after it became available until the Health and Physical Building was completed in 1931. Western and the community took great pride in that new building. It was not old; it was not red; and it was not a barn. I suspect that the erroneous name was applied sometime after World War II by some one who did not know much about the history of Western and its basketball program.